How many are the lies that Egypt's military regime has forwarded concerning its role in attacking and killing Egyptian demonstrators since it usurped power a year ago? There were, for instance, the lies concerning the Maspero massacre, where the military slaughtered Christian Copts who were protesting the constant attacks on their churches. Despite all the video evidence that the military ran armored-vehicles over Copts [apparently now removed by YouTube], the military regime insisted that it would "never, never" run over civilians; that the very idea was "impossible, impossible!" It even showed a video of a military-vehicle running amuck, claiming it was hijacked by Coptic protesters (it was later revealed that an Egyptian soldier was, in fact, inside driving). More recently, Mohamad Tantawi, the head of the military—and de facto head of Egypt—said that the widely circulated video of soldiers beating, stripping, and kicking a female protester is "entirely fake"—a ludicrous assertion, even if Jimmy Carter supports it. 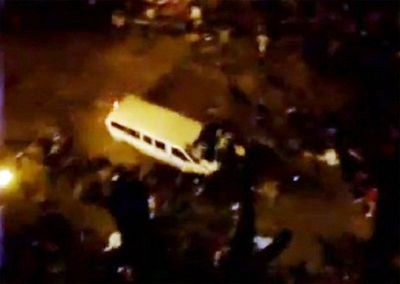 Image of U.S. embassy vehicle running over Egyptian protesters, Jan. 2011.
Who is the latest victim to be scapegoated for the military's crimes against its own citizenry? None other than the U.S.A.
As we have stated in previous press releases, there is absolutely no truth to reports that U.S. embassy employees or diplomats were involved in hit-and-run incidents using U.S. diplomatic vehicles, injuring or killing protestors in January 2011 in Cairo. There is also no truth to statements alleging that the keys inside U.S. diplomatic vehicles are coded and can only be used by U.S. Embassy employees. On January 28, 2011, however, a number of our U.S. Embassy vehicles were stolen. After these vehicles were stolen, we heard reports of their use in violent and criminal acts. If true, we deplore these acts and the perpetrators. Egyptian authorities have conducted an investigation that has led to the recovery of some of these stolen vehicles. Who is behind these accusations? The military? As mentioned, it did make similar accusations against Coptic protesters, saying they hijacked and manned the military-vehicles that ran over fellow Copts at Maspero—only to be exposed as lying by Al Dalil. While it is not altogether clear who is behind these accusations—this report indicates a lawyer of a former Egyptian official being tried, while older reports mention "communiqués"—it is, of course, the military regime that stands to gain by this latest case of blaming the other.